Have a question on Forza? Forza is available in 3 different colors - Pearl White, Sword Silver Metallic and Matt Gunpowder Black. Among the array of all the amazing big bikes Honda sold in Malaysia, the Forza happens to be a humble one, for it is the only big scooter available in the South East Asian country. This flagship scooter from Honda ticks off all the right boxes when it comes to big bike appeal translated into a gearless experience. Honda sells the Forza in three different color options – Pearl Horizon White, Sword Silver Metallic and Asteroid Black Metallic. The Honda Forza scores full marks when it comes to visual appeal, as its futuristic looks and tall stance demand second attention for sure. The Honda Forza impresses you with its tall stance the moment you look at it from the front. The front apron has got a curvy yet vertical form, at the center of which is placed a full LED headlamp assembly The apron itself has got a very busy dual tone styling, which gives it an edgy aggressive character. Sitting above the front apron is a tall and fully adjustable windscreen, however, the tall apron mounted rear view mirrors look a bit overboard and quirky. 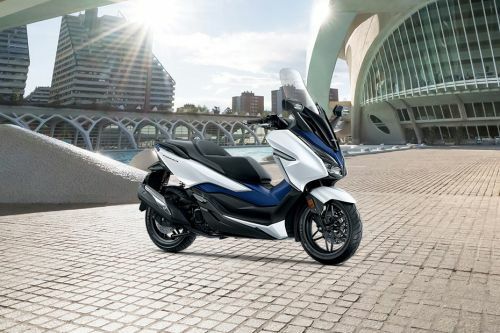 The edgy theme of the overall design of the Honda Forza continues in its side profile as well, as the scooter has got a visual bulk thanks to the big side body panels which are set at quite a lower height. The stepped theme for the seat, big split pillion grab rails, separated floor board with long spaces and long and big single piece handlebar add into its large appeal. While the black alloy wheels do accentuate its sporty design theme, the single exhaust pipe looks a bit mundane compared to the rest of the scooter’s design. At the rear, the Honda Forza manages to look minimalist despite all the bulk at the front and on the sides, with a small LED tail lamp nestled below the tailpiece. Matching the ‘big’ demeanor of the Forza is its very comprehensive instrument console. The part digital console includes analog dials for speedometer and tachometer, with a blue backlit LCD panel nestled in between them, which shows clock, fuel gauge, odometer, trip meters, engine temperature, distance to empty and average fuel consumption. What further impresses in the Forza is its massive underseat storage space, which is capacious enough to house two helmets at one time. The Honda Forza’s visual appeal might make an impression of its underpinnings to be equally very sophisticated as well. However, that’s not the case, as the scooter comes with simple chassis design and suspension setup – standard hydraulic telescopic forks at the front and twin shocks at the rear. The suspension, like the engine performance, offers a perfect balance between sporty riding dynamics and supple ride quality, thanks to the setup on a softer side. The larger wheels on both the sides – 15-inch front and 14-inch rear, play their role in enhancing the stability on all conditions. Even the single disc brake setup at both the ends work flawlessly as well. Powering the Honda Forza is a four-stroke, liquid-cooled, fuel injected, 279cc motor, which is mated to a CVT transmission and belts out a maximum power output of 25 PS and a peak torque output of 27.2 Nm. As expected from a Honda powertrain, the engine of the Honda Forza impresses with its butter smooth refinement and linear power delivery, which is great for the prolonged urban duties as well as long distance touring as well. Being a flagship quarter liter scooter, the Honda Forza comes with the compulsory safety features as per the segment standards, including the dual channel ABS, Traction Control and a common locking mechanism for ignition keyhole and under seat storage space. With the Forza, Honda has managed to pull off a great product which understands your urban needs of commuting without much effort. However, while the Forza is high on style when it comes to the overall design, we would have loved to see a couple of more premium and exclusive features which would have definitely raised its appeal. Rest assured, being a Honda, it is pretty much sorted out in mechanical aspects like performance and ride quality, making it a great stepped up urban ride. What are the Safety Features Available in Honda Forza? Is Honda Forza available in Electric?